What a difference a week makes. This time last week, we were dreading what could happen with a loss to Dortmund, after failing so remarkably against Manchester United. Now, we're looking at two straight wins and two clean sheets to boot. With a win tonight against Southampton, the Gunners would find themselves just three points out of third place, even if it only brings them back to sixth in the table. Yes, Arsenal have struggled mightily in this league campaign at times, but sometimes it's hard to focus on the fact that many other teams have as well. Arsenal have dropped points on eight occasions this year. City and Southampton have dropped points on five occasions. Everton have dropped points on nine occasions. Spurs have lost five times. Liverpool have lost six times. There's plenty of time to right this ship. Sanogo is back. Also snoods; snoods are back. Arsenal are close to getting rid of one defensive injury crisis, as Laurent Koscielny returned to the starting XI last weekend and Mathieu Debuchy should be in full training soon. But, God doesn't close one injury crisis without opening another one: Nacho Monreal left Saturday's game at West Brom with a knee injury and Kieran Gibbs picked up a hip problem as well. It's possible that Arsenal might have to start tonight's match with zero fit left backs; however, Monreal trained yesterday with the first team, so the suggestion is he, at least, will be ready to go. Alex Oxlade-Chamberlain picked up an injury against West Brom as well, but he played on and trained yesterday as well; he too should be good to go. In addition to Debuchy, David Ospina returns to full training next week as well. That's good news, as Wojciech Szczesny will miss tonight's match, still dealing with the hip injury and/or dead leg he suffered against United. Emiliano "don't call me Damien" Martinez, he of two straight clean sheets, will continue to deputize. There's no news on Theo Walcott or Abou Diaby; both will miss tonight. Mikel Arteta, Mesut Ozil, and Jack Wilshere will all miss the entirety of December and are likely to return in that order, the former two in January and the latter in March. As for tonight's starting XI, I can't see it being much different from Saturday; this is not the fixture in which to consider rotation. If Arsenal pick up all three points here, then maybe, just maybe, they can rotate a little at the Britannia this coming weekend. 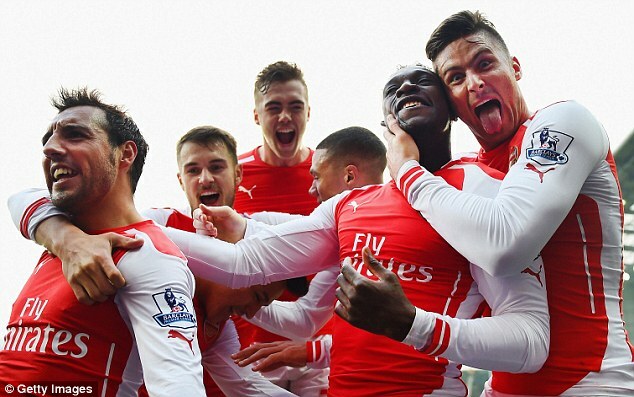 Predicted XI: Martinez, Chambers, Mertesacker, Koscielny, Monreal, Flamini, Ramsey, Alexis, Cazorla, Welbeck, Giroud. 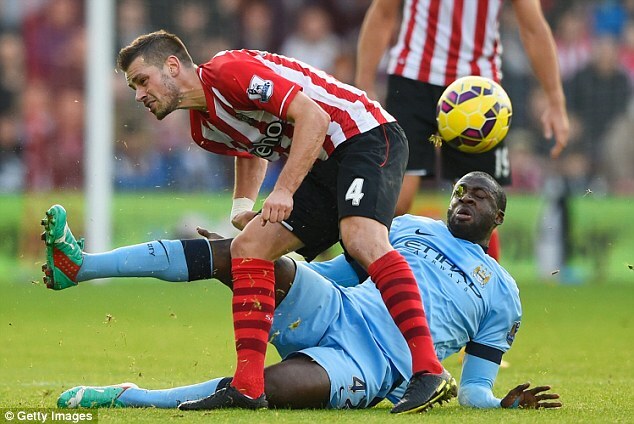 The biggest blow for the Saints is the injury to Morgan Schneiderlin; their midfield linchpin left Sunday's match against Manchester City with an injury to his right adductor muscle; what was 0-0 after 45 minutes ended 3-0 to the reigning champions after the substitution. Toby Alderweireld, usually a center back, might deputize in the holding role, as he did on Sunday; Maya Yoshida came off the bench to play in defense as Alderweireld advanced forward from his starting position in the back four. Ronald Koeman will be boosted by the news that midfielder Jack Cork should be fit to return from illness, though the club is still without James Ward-Prowse, Jay Rodriguez, and Sam Gallagher through long term injuries. Cork's return means he could likely end up in a midfield trio with Alderweireld and Victor Wanyama; Steve Davis would drop to the bench. While Dusan Tadic and Graziano Pelle, with six and two goals respectively this season, are certain to start up front, the third forward is in question. Shane Long was on the bench on Sunday, with Sadio Mane starting; Long came on for Mane in the 68th minute against City. It's probably a toss-up between which of the two starts tonight. Predicted XI: Forster, Clyne, Yoshida, Fonte, Bertrand, Alderweireld, Wanyama, Cork, Tadic, Long, Pelle. nailing this header to win against West Brom. After the narrative written about these squads through most of the autumn, these two clubs are currently moving in the opposite directions. They're flipping the script! You just can't write scripts like this! It just can't be done! Fiction writers like myself just aren't creative enough! Real life is magical. Sorry, I got off track there. Arsenal have won two straight via clean sheet; it's the first time they've won two in a row via clean sheet since... well, a month ago, against Sunderland and Burnley. Are we sure this script is that crazy? Arsenal will look for their first three game winning streak since... a month ago, when they beat Anderlecht, then Sunderland and Burnley... A win would mark two straight in the league for the first time since, ... you know, I'm not going to say it. As for Southampton, they've dropped points in their last two games for the first time since the opening two games of the season. They started the year with a loss to Liverpool and a draw with West Brom; in their last two, they've drawn with Aston Villa and lost to Manchester City. Sandwiched between those four matches was a streak of nine where the Saints won eight. Those wins came against West Ham, Newcastle when they were still bad, Swansea, QPR, Sunderland, Stoke, Hull, and Leicester. Essentially, beating the teams you're supposed to beat, something Arsenal have not always done this year. Arsenal and Southampton have already met once this season at the Emirates in the third round of the League Cup; the visitors won 2-1. Arsenal led early through a beautiful Alexis Sanchez set piece, but Southampton equalized from the penalty spot and won it on Nathaniel Clyne's long range wonder goal. Arsenal took four of a possible six points from Southampton last year; an Olivier Giroud brace won the match at the Emirates 2-0, thanks in part to some unfancy footwork from Saints keeper Artur Boruc. Both sides played a 2-2 draw at St. Mary's in late January. Southampton led 1-0 at halftime, Arsenal stormed back to score twice in four minutes, but Adam Lallana equalized two minutes later. Mathieu Flamini was sent off with ten minutes to play. Those two dropped points proved to be the beginning of the end for Arsenal's run at the top of the table; the Gunners went on to win just three of their next 10 league games before closing out the year winning their final five. Arsenal are unbeaten in their last nine league matches against the Saints. Southampton's last league win at Arsenal came on November 21, 1987. The referee is West Midlands-based Andre Marriner. Marriner led the Select Group in red cards last season, with 13. He also led the Select Group in red cards given to the completely wrong player, with one, which you'll probably recall. Incidentally, he's only shown one red card in the Premier League since his incident of mistaken identity at Stamford Bridge and that was to Ryan Shawcross, which is excellent, except it was against Spurs. The only red card he has shown this season was in a Championship match to Bournemouth's Yann Kermorgant, who is best known for ruining Leicester's 2010 promotion bid. Anyway, before that unpleasantness at the Bridge, Arsenal had won four straight with Marriner in the middle: 4-1 over Sunderland and 2-0 over Hull City last year, as well as 1-0 over Fulham and 5-1 over West Ham United the year before that. 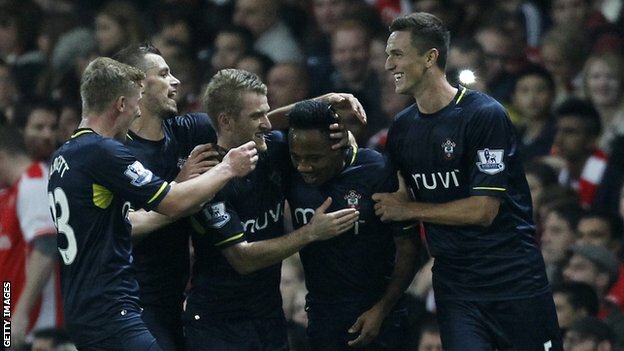 Southampton have seen Marriner only once this season; it was for their 8-0 win over Sunderland. So, I suppose that bodes well for them. In fact, they've won four straight with Marriner in the middle and are unbeaten in eight such matches. The last time the Saints lost a match with Marriner as the referee, it was August 30, 2008 and Southampton were in the Championship, on their way to relegating to League One; they lost that match to Blackpool, 1-0. 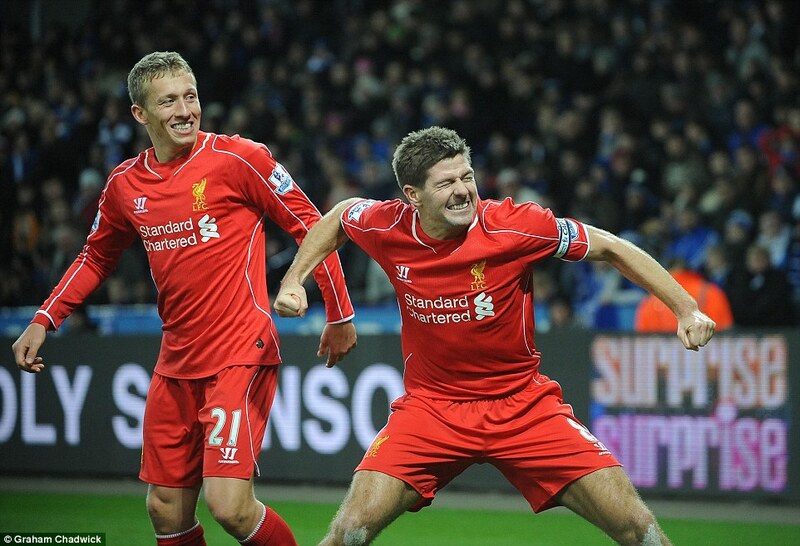 Gerrard scored after being dropped at the weekend. Don't look now, but the Clarets are unbeaten in their last four and have momentarily climbed out of the drop zone. Meanwhile, Newcastle have dropped points in two straight matches after their five game winning streak; Tim Krul is expected to be out for up to six weeks with an ankle problem, adding injury to insult. United have now won four straight and are just a point back of idle Southampton for third place. Stoke have now lost three straight ahead of Arsenal's visit at the weekend. QPR's loss means they're still in the relegation zone, just a point ahead of last place Leicester. Swansea have leapfrogged the idle Arsenal for sixth by two points. Aston Villa win for the first time since September 13; they had lost six straight then drawn three straight before Christian Benteke's 32nd minute goal against the run of play earned the Villans all three points. It was a perfect night for all three claret and blue teams as the Hammers came from behind to win at the Hawthorns; West Ham still sit in fifth place while West Brom are just two points from relegation. How would you, Gooner readers, feel if Spurs were the team to finally beat Chelsea? Bad? Bad, but also a little relieved? Indifferent? It's important to note that Diego Costa is suspended for yellow card accumulation. Sunderland and City face-off in the Pantilimon game. Everton have struggled with Thursday night football this season, at least in terms of their Sunday league fixtures that follow; the Toffees are unbeaten in their Europa League group, but have picked up only four of a possible 15 points from the league matches that follow. This midweek fixture doesn't ease the congestion at all as Everton host 18th place Hull; the Tigers have gone six matches without a win and have lost four straight. Burnley's win yesterday means Hull starts the day in relegation territory. Sunderland are unbeaten in four and have drawn their last three since dropping Vito Mannone for Costel Pantilimon; they'll be buoyed (but possibly exhausted) by their 0-0 draw with league leading Chelsea as their goalkeeper faces his former club. The question is, can he shut down Sergio Aguero, who already has a dozen league goals this year? City come in just six points behind the Blues for top spot, but will be without the suspended Eliaquim Mangala. John Painting is a contributing writer to The Modern Gooner and all-around neat guy. You can follow him on Twitter @zorrocat, if you like that kind of thing.